Asserting its position in the market as a leader in the digital marketing space, Trivera has launched its brand new website. The new site incorporates many of the features it has been recommending that customers incorporate into their own sites. The biggest, and most obvious feature is a fully responsive architecture and design. That concept provides visitors an experience where all site elements and content are automatically formatted for the specific device they're using. While desktop users will see a website optimized for a full width monitor, tablet users will see the elements readjust to optimally, fit their display, even as they go from landscape mode to portrait mode. The use of retina images provides viewers with iPads photos and graphics in stunning resolution. Visitors on smartphones will see the navigation change to a style that better accommodates finger taps instead of mouse clicks. Phone numbers and addresses take advantage of mobile functionality and while images are resized to take up less of the display, text sizes are scaled to provide greater readability. The home page features an example of parallax scrolling, where layers and the background scroll at different rates to create a three dimensional effect. While some sites use the effect to create an entire website that parallax scrolls from the top of the home page, the Trivera site chooses the more subtle use of the effect to avoid the damage to Search Engine placement that the other approach produces. Years of blogs were imported into the new site, a project that was more difficult than it may appear. The previous site used Digitalis as the main site Content Management System, and used Wordpress as the blog platform. Both the site and the blog for the new site reside in a single implementation of Concrete5, made possible by Trivera's technical team performing a major re-programming of that platform's blog to include many of the Wordpress functions that bloggers rely upon. The site makes extensive use of Concrete5's native functionality to display and rotate team and office photos. Social Media plays a large part in the new site, with social feeds from Trivera and team members' Twitter, Facebook, Pinterest, LinkedIn and RSS feeds displaying on the home page and an expanded "Notebook" section. Blog posts contain social sharing buttons, and links to Trivera's Social Media profiles display on every page. 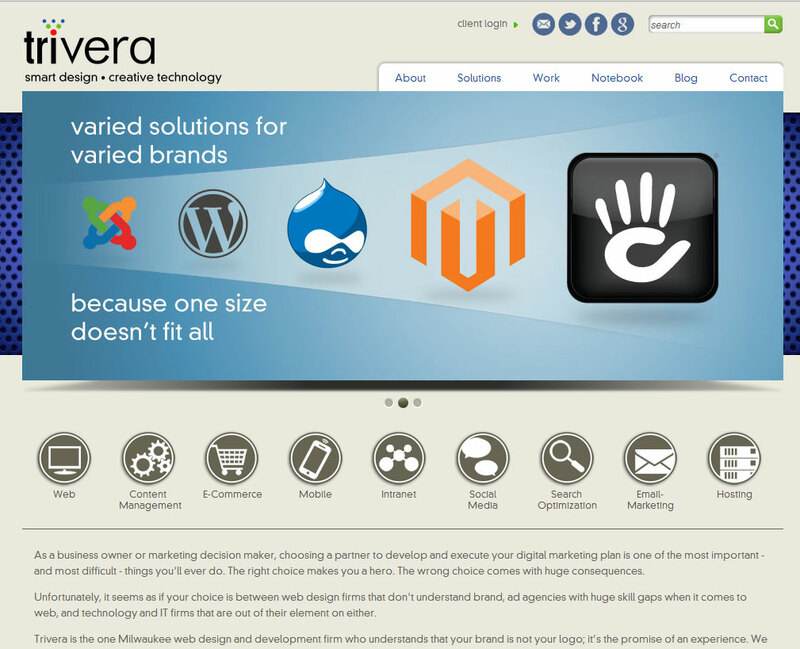 The website represents a quantum leap from the previous generation of website development and showcases a lot of the features, functionality and forward thinking that Trivera offers its clients. I Hate to Break The News: Effective Marketing is Hard. And Costs Money.